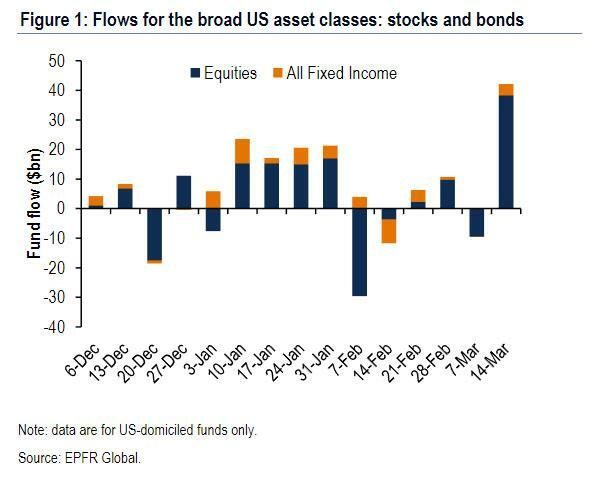 One week after US stocks suffered "massive" outflows despite a net inflow into global equity funds while the S&P jumped, everyone is back in the pool as a "wall of money" returned with a vengeance" this week, driving record inflows into both global and US-focused equity funds as concerns around trade dissipated, while billions more were plowed into tech stocks according to the latest weekly fund flow report from Bank of America. According to BofA CIO Michael Hartnett, a record $43.3 billion was put into equities this week as investors shrugged off trade war risks that had initially sent stocks reeling, even as those very risks returned in the subsequent week and have pressured the S&P lower on four consecutive days. 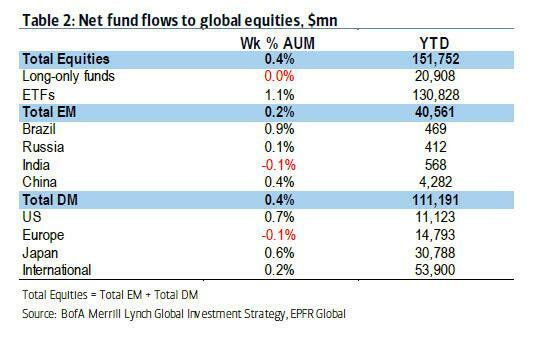 There was no good news for active investors, however, as more than all of the inflows ($43.9BN, also a record) went to ETFs, with mutual funds suffering another weekly outflow of $0.6 billion). On a YTD basis, a record $131BN has been allocated to ETFs, or 3.6% of AUM, with just $21BN going to "long onlies"
Meanwhile, bond funds saw a "more humble" $2.4 billion in inflows. Looking at recent trends, BofA calculates that equity inflows are outpacing bond inflows for the first time since 2013, with annualized flows of $717 billion. Bond funds managed relatively minute inflows of $2.4 billion this week. To Hartnett, these "Flows indicate clients positioned for higher EPS, higher short rates, higher bond yields, lower US dollar." And yet, something odd has emerged: the record inflows are out of step with more muted returns from equities: "chart-topping inflows not coinciding with headline returns...check out $25tn NYSE index (NYA Index) down YTD." All major European stock indices are still in the red since the start of 2018, while the S&P 500 is only one that is slightly up. Looking at a sector breakdown, investors just can't get enough of tech stocks, and another record was broken in the last week when $2.6 billion went into tech stocks this week, an all time high, putting the excesses of the dot come era to shame. 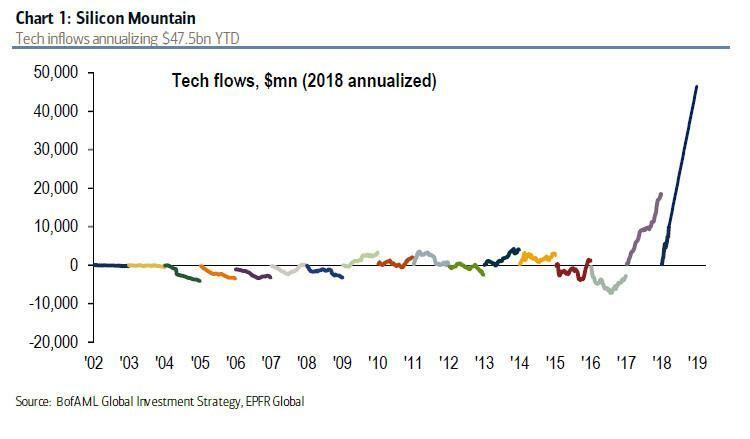 So far, a total of $9.8 billion has gone into tech funds YTD, making the annualized flow figure a massive $46.5 billion. Hot on tech's heels, financials drew in $1.6 billion, and are the second most popular sector after tech, with $7.3 billion of inflows year-to-date. Separately, U.S. large-cap funds, which saw $10.1 billion in redemptions last week, drew in more than double that amount this week, enjoying their fourth highest ever inflows at $22 billion. But wait, there's more: there was also a record inflow into US growth ($5.8bn), US small cap ($5.4bn), and US value ($4.1bn) funds. Meanwhile, European stocks saw modest outflows of $1.3 billion, even as emerging market equities continued to draw in cash ($2.7 billion) and Japanese equity funds enjoyed their 15th straight week of inflows as the popularity of the asset class proved resilient. 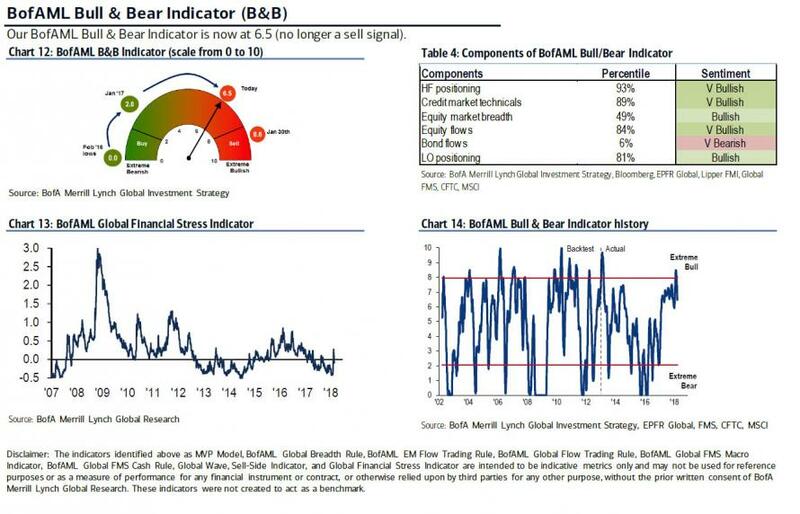 First, despite massive inflows into stocks, BAML’s Bull & Bear index of investor sentiment fell from 6.8 to 6.5 on "accelerating EM debt/ HY corp outflows & placid equity returns." 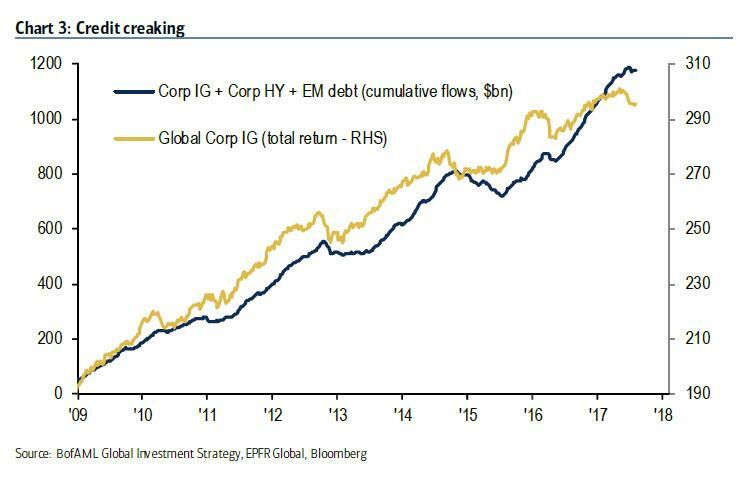 Second, the bank also warned that "Credit is creaking", and echoed Bill Blain's comments from this morning, that there is now a "clear negative inflection point in HY flows" while the broader “yield trade” (IG+HY+EM) inflows & returns are peaking", which makes it a headwind for equity return. To this point, Hartnett also warned that Treasuries funds drew in $0.3 billion in their eighth straight week of inflows, and as such Treasuries & bunds are hinting at a “growth scare” which makes stocks vulnerable. Third, Hartnett warned that the recent surge in Libor was likely to lead to tighter financial conditions; as we have reported almost daily, short-term borrowing costs have surged in the past weeks to levels last seen in the 2008 global financial crisis, while both LIBOR-OIS and FRA-OIS have exploded to levels suggesting an acute funding crisis is imminent. And tied to this, should the U.S. dollar spike once the funding crisis finally manifests itself in trades, it could ding tech and emerging market stocks.